Oh happy day! Nothing get me going more than an 80 degree cloudless day, and that coupled with the fact that I have the day off has left me close to a state of bliss. The reason i’m telling you about my weather preferences is because during warm weather people often shy away from the kitchen; they seem to equate it with heat, and that’s a shame because there are TONS of recipes out there that necessitate little if any cooking. 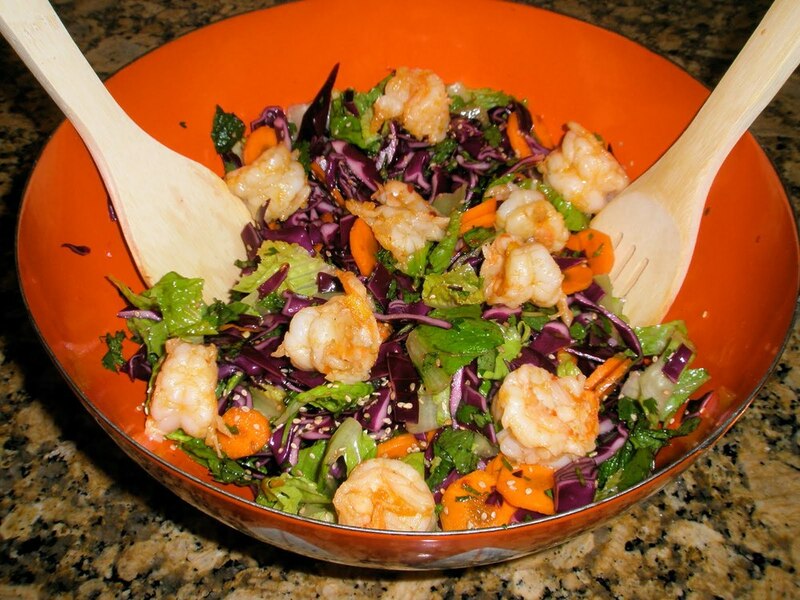 Today’s recipe for Spicy Thai Shrimp Salad is one such recipe. It makes for a flavorful and satisfying meal without all the fuss of heating up ovens and pulling out multiple pots and pans. Curiously enough the first time I made this was in the middle of winter as a result of becoming aware that all i’d eaten over the past few days was carbohydrate and protein dominated meals. This recipe provided a welcome reprieve from such “heavy fare” and made me feel like I was doing my body good to boot. Packed with a multitude of veggies including; cabbage, carrots, cilantro, and green onions, and topped with a generous serving of protein packed shrimp this is an awesome nutrient packed meal. Of course since it’s on Leggycooks it is also quite delectable, and is topped with a dressing that includes sriracha and fish sauce. So if you are feeling a little green from lack of greens in your diet give this lovely salad a try and let the oven chill for a night. *The amounts of vegetables are approximate so feel free to use more or less of a specific ingredient depending upon personal preference. Whisk together the dressing ingredients in a small bowl and allow to mingle in the fridge while you chop the salad ingredients. Once all the vegetables are cut move on to the shrimp. Mix together the shrimp, olive oil, a sprinkling of salt, and lime juice. Cook shrimp in a large grill pan or skillet over medium high heat turning occasionally until opaque and pink in color. Remove shrimp from heat immediately. Combine dressing with vegetables and shrimp tossing to evenly coat everything in the bowl. Plate and finish with a sprinkling of sesame seeds. Yum! Posted in salad, seafood, Thai, vegetarian. Tagged bell peppers, cabbage, carrot, cilantro, EVOO, fish sauce, lime, shrimp, sriracha, white sugar.